How will your alpha dog fit in at dog daycare? If you have an alpha dog, you might wonder what days will be like for your pup and his new pals when spending time at dog daycare. First, how do you even know if you have an alpha dog? People tend to think of dominant, alpha and aggressive dogs are the same, when in fact they are very different. A dominant dog craves power and respect from others or wants to be recognized as the alpha. This dog likes to test boundaries and can be difficult to control. An aggressive dog has intent on hurting other dogs or people. These dogs can express many types of aggression such as fear, dominance, possessiveness and guarding. An alpha dog is a calm and confident dog that sets her own rules and boundaries for herself and the pack. Alpha dogs have a couple of advantages in dog daycare. 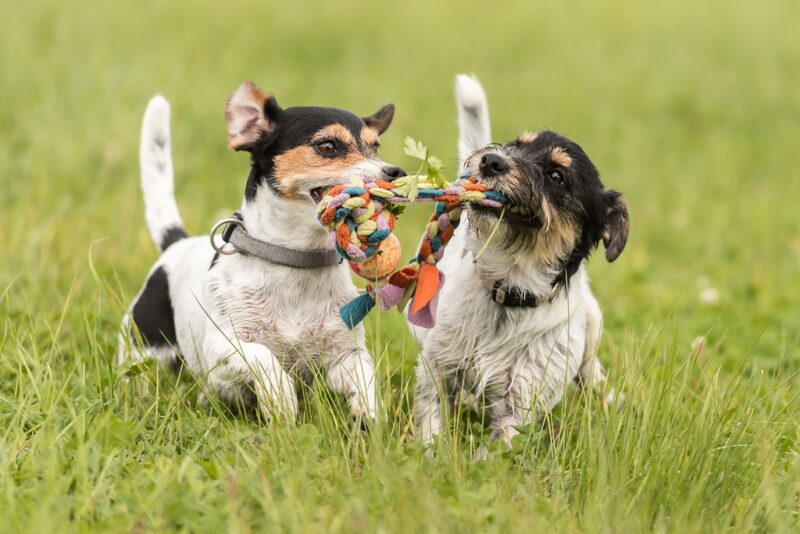 – Dogs with extroverted leadership characteristics are good role models for other dogs in daycare and bring balance to the pack. – Outgoing alpha dogs fare better in the group setting of dog daycare than their shyer canine cousins. Interacting with multiple mutts offers a reward to these social pups. – According to Dogster.com, separation anxiety affects alpha dogs less than other pups in the pack. Leaving your dog at daycare can present less stress for you and your dog than other pet parents might experience. Of course, disadvantages exist for alpha dogs at daycare. Unchecked alpha dogs will reinforce their rules to all of the dogs in the daycare, which may not mesh with the humans of the group. That’s why at Hot Dog On A Leash , dog handlers are trained to be the leaders of the pack. A common misconception is that all alpha dogs want to be alpha. That’s not necessarily true. Any dog will step into the role of alpha if they feel there is a lack of leadership. Your dog might not want to be alpha but is merely filling a void in the family hierarchy. As dog owners, we have to provide the leadership and direction that dogs need. If you have an alpha dog at home, your job is to set boundaries and reinforce rules. Being the leader of your pack at home requires confidence and diligence as a dog owner. Having a strong leader at home, makes it easier for alpha dogs to adjust to being No. 2 at daycare as well. Look into the characteristics of your dog’s breed, too. You’ll get a better understanding of common behavior and training mistakes people have made in the past. Tags: How will your alpha dog fit in at dog daycare? http://hotdogonaleash.com/wp-content/uploads/2018/09/How-will-your-alpha-dog-fit-in-at-dog-daycare.jpg 837 1254 bruce http://hotdogonaleash.com/wp-content/uploads/2017/10/hdoal-300x247.png bruce2018-09-08 00:56:522019-04-10 05:23:48How will your alpha dog fit in at dog daycare? 8 Ways To Spoil The Living Daylights Out Of Your Dog Why is my adult dog suddenly going to the bathroom in the house?